Let us do a FREE Market Analysis on YOUR HOME. WE can sell your home. We are a full service agency offering all the tools you need to get your home sold quickly. We do the work for you but we let you keep more of your money by offering 4.5% Commission or LESS. Call and find out more. Your Legal Matters Are PERSONAL To Me. I work directly with each client. Sea and Sand Realty has been serving the Grand Strand and beyond in South Carolina since 2010. It is the Mission of our Company is to provide people with smooth and affordable Real Estate sales and service. We know the Market and we do the legwork, keeping you up-to-date with new listings and conditions as they impact the Market. As a full-time, full- service Real Estate Brokerage, we’ll use our connections to get you the best deals possible. Work with a pro and keep MORE of your Dough! Hello, I am Jackie Taylor, I hold a Bachelors in Marine Science and an Associates in Forestry/Wildlife Management. I have over a decade of combined experience in marine and wildlife management, environmental health, storm water management, water quality and public education. I am a member of the Water Quality and Drainage Commission for the City of Conway, and a notary public. 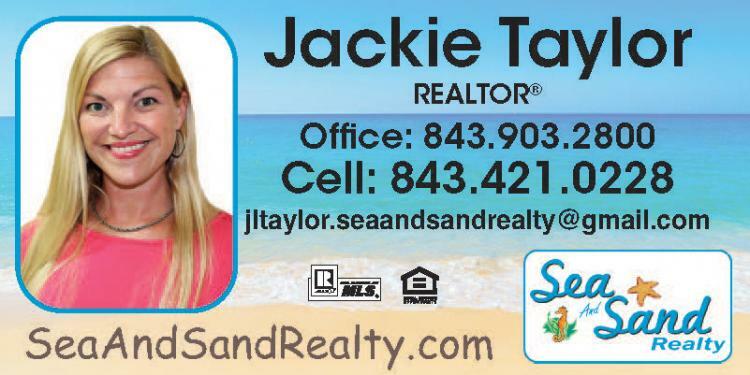 I am a salesman for Sea and Sand Realty in Myrtle Beach, SC. My interest in real estate stems from my passion about water quality and land management. With my skills and expertise, I have created a perfect marriage between environmental awareness and property ownership. I can assure you that with a 2 minute conversation I can and will find you the home or condo of your dreams. A warm-hearted girl steeped in southern hospitality. Born in Charleston, and raised in Conway, South Carolina; my family spans through the Grand Strand and Low Country (The Carolinas), with deep roots established through the Grand Strand and Low Country. I am a member of National Association of Realtors, South Carolina Association of Realtors and the Coastal Carolina Association of Realtors. in addition to real estate, I enjoy Motherhood, beekeeping, art, and outdoor activities. I am a member of the Blackwater Beekeepers Association, South Carolina Beekeepers Association.